Simranjeet Singh scored two goals and was chosen the Man of the Match for his excellent performance. 20.30 IST: It's over and India thrash South Africa 5-0 in opening match. * No penalty corner for Africa after the review. 20.09 IST: India score two goals in the third quarter to extend the lead by 4-0 against South Africa. 19.52 IST: Indian team continues to keep possession with their excellent passing game. 19.49 IST: The break is over and Indian team is back on the ground to continue their dominance against the South African team. 19.45 IST: Indian hockey legend Dhanraj Pillay is in the stadium to support the Blue Army. * Second Quarter kicks off India are leading by 2 goals right now. 19.21 IST: India lead 2-0 against South Africa at the end of the first Quarter. 19.17 IST: GOAL! Akashdeep strikes for team India. IND 2 SA 0. 19.14 IST: GOAL! Mandeep Singh strikes the first goal for India. IND 1 SA 0. * Refree asks for a review and India wins the penalty corner. 19.10 IST: Indian fans are super excited and all dressed up for the Pool C match. 19.06 IST: Indian skipper creates an excellent chance to gain the early lead but the strikes do not connect it properly. 19.04 IST: In the early minutes India team is attacking heavily on South Africa. * And the countdown starts. 19.00 IST: It's time for the Indian's to stand up for their National Anthem at the Kalinga stadium in Bhubaneshwar. 18.58 IST: First up is the national anthem of visitors South Africa. 18.55 IST: India and South Africa players are on the field for the national anthem of their respective countries. When is the India vs South Africa Hockey World Cup 2018 match? The India vs South Africa Hockey World Cup 2018 match will be played on November 28, 2018. Where will the India vs South Africa Hockey World Cup 2018 match be played? The India vs South Africa Hockey World Cup 2018 match will be played at Kalinga Stadium in Bhubaneswar, Odisha. The India vs South Africa Hockey World Cup 2018 match will begin at 7 pm IST. Where to watch the India vs South Africa Hockey World Cup 2018 match Live on TV in India? 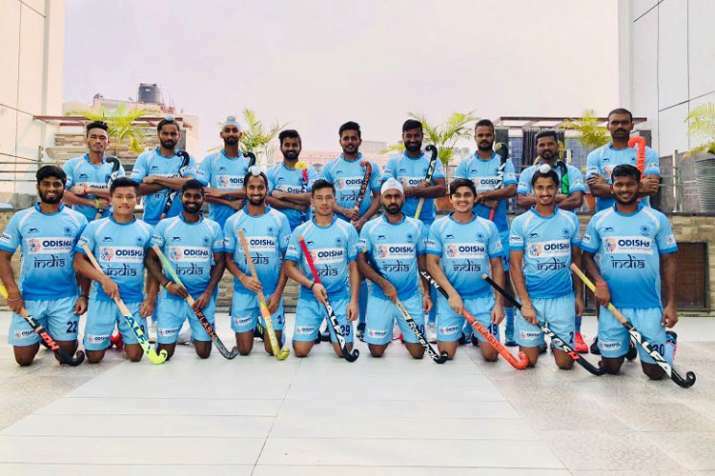 You can watch the India vs South Africa Hockey World Cup 2018 match Live broadcast on TV on DD Sports in Hindi Commentary and Star Sports Select 1 and Star Sports Select 1 HD in English commentary. Where to watch the India vs South Africa Online Live streaming in India? You can live stream India vs South Africa Hockey World Cup 2018 match online on Hotstar and on the official YouTube channel of International Hockey Federation. What is the Indian and South African squad for the Hockey World Cup 2018 match?